I thought I posted up about this last June, but guess I didn’t! WHOOPS, my apologies, Kevin. 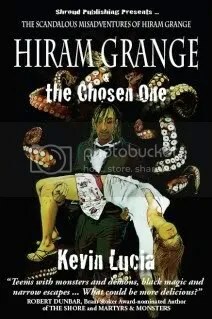 Hiram Grange and the Chosen One by Kevin Lucia is the sixth book in the Hiram Grange series, and it was a real hoot. My review gets into all of the details over at Outsider Writer’s Colletive, but suffice it to say it was a wild ride. So go check it out. Imagine F. Paul Wilson with a little James Bond, Sherlock Holmes and Phineas Poe sprinkled in. This entry was posted in Book Reviews, Other Voices.